Last November, I was Marshal in Charge at a rapier event, and I wanted a fancy garment to show that I was acting as a marshal. For years, I'd always heard the phrase "marshal tabard," but I never wanted to wear a tabard. Then a member of my barony made a gorgeous marshalling German capelet, and it opened my eyes to the possibilities - I could make a different piece of garb, one that fit my aesthetic, to be my marshalling "tabard." For those who aren't familiar, a marshal is someone in the SCA who is thoroughly trained in the safety procedures of a particular martial art. It takes somewhere from three months to a year to finish all of the required training to become a rapier marshal, and every moment of it is useful. A marshal can run martial practices and events, including all the paperwork and reports involved. They watch other rapier fighters to make sure everyone is having a good time and that everyone is behaving safely, they authorize new fencers, they routinely inspect equipment, they mediate disagreements, they adjust spacing and timing of fights so that the most people can have the most fun at the same time safely, and, in bad cases, they have the backing of the crown to pull unsafe fighters off the field and tell them they aren't allowed to fight anymore. I thoroughly enjoy being able to give back to my rapier community through marshalling. Here are photos of the linen marshal's hood I made! I am beyond happy with how this turned out. The insignia of the rapier marshal is black and yellow slanted stripes (similar to caution tape), and crossed yellow rapiers on a black field. I love linen hoods because they keep the sun off my neck and shoulders (to avoid sunburn) and out of my eyes (the sun gives me headaches), without overheating me by adding more layers to my torso. All of the seams in this garment are french seams. ALL of them. These stripes are all french seams that match up in a perfect chevron. It took forever, but is soooo worth it - these seams will not fray! This photo shows off the crossed rapier insignia of the rapier marshallate. The rapiers are entirely embroidered by hand. The texture is so neat! The inside of the finished hood. Look at all that hand embroidery and those beautiful french seams. 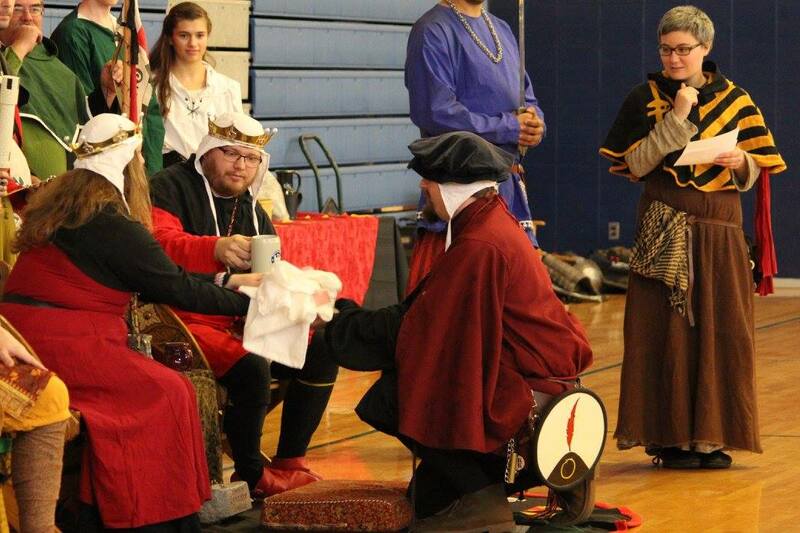 Here's the best photo I have of me wearing it, as I read the results of the rapier tourneys into court at Grand Day of Tournaments last November. Anyone else working on cool marshal "tabard" options? I'd love to see them!